LOS ANGELES — Hal Blaine, the Hall of Fame session drummer and virtual one-man soundtrack of the 1960s and '70s who played on the songs of Frank Sinatra, Elvis Presley and the Beach Boys and laid down one of music's most memorable opening riffs on the Ronettes' "Be My Baby," died Monday. On hearing of his death, the Beach Boys' Brian Wilson called him "the greatest drummer ever." The winner of a Grammy Lifetime Achievement Award last year, Blaine's name was known by few outside the music industry, even in his prime. But just about anyone with a turntable, radio or TV heard his drumming on songs that included Presley's "Return to Sender," the Byrds' "Mr. Tambourine Man," Barbra Streisand's "The Way We Were," the Beach Boys' "Good Vibrations," dozens of hits produced by Phil Spector, and the theme songs to "Batman," ''The Partridge Family" and dozens of other shows." 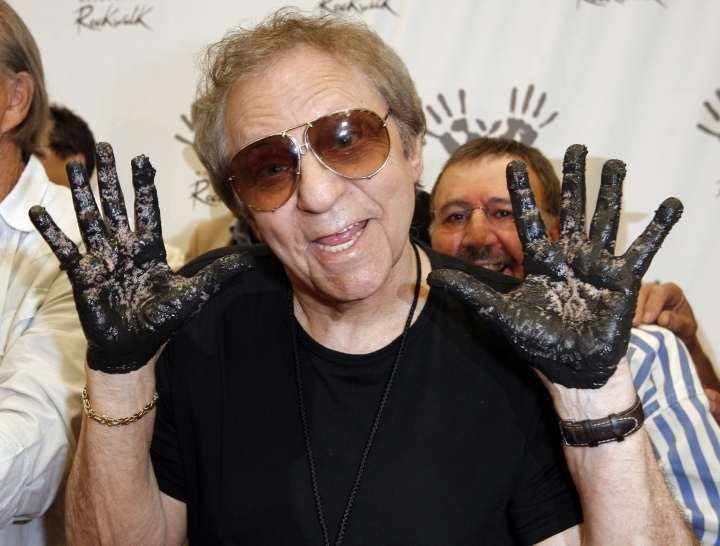 "Hal Blaine was such a great musician and friend that I can't put it into words," Wilson said in a tweet that included an old photo of him and Blaine sitting at the piano. "Hal taught me a lot, and he had so much to do with our success — he was the greatest drummer ever." As a member of the Los Angeles-based studio band "The Wrecking Crew," which also featured keyboard player Leon Russell, bassist Carol Kaye and guitarist Tommy Tedesco, Blaine forged a hard-earned virtuosity and versatility that enabled him to adapt quickly to a wide range of popular music. According to the Rock & Roll Hall of Fame, he played on 40 No. 1 hits, 150 top 10 songs. "Trust me, you loved his work," comedian J. Elvis Weinstein tweeted Monday. Blaine also played on eight songs that won Grammys for record of the year, including Sinatra's "Strangers In the Night" and Simon & Garfunkel's "Bridge Over Troubled Water." "Godspeed Old Friend," Sinatra's daughter Nancy Sinatra said alongside an Instagram picture she posted of Blaine backing her up as she sang. Out of so many notable sessions, his signature moment was the attention-grabbing "on the four" solo — Bum-ba-bum-BOOM — that launched the classic "Be My Baby," a hit for the Ronettes in 1963 that helped define Spector's overpowering "Wall of Sound" productions. The song remained a radio staple for decades and got new life in the '70s when it was used to open Martin Scorcese's "Mean Streets" and again in the '80s when it was featured in "Dirty Dancing." Few drum parts have been so widely imitated, from Billy Joel's "Say Goodbye to Hollywood" to The Jesus and Mary Chain's "Just Like Honey." In a 2005 interview with Modern Drummer magazine, Blaine said that he wasn't quite sure how he came up with the solo. To the best of his memory, he accidentally missed a beat while the song was being recorded and improvised by only playing the beat on the fourth note. "And I continued to do that," he recalled. "Phil might have said, 'Do that again.' Somebody loved it, in any event. It's just one of those things that sometimes happens." Blaine nicknamed himself and his peers "The Wrecking Crew," because they were seen by their more buttoned-down elders as destructive to the industry — an assertion that Kaye and others disputed. Many members of The Wrecking Crew worked nonstop for 20 years, sometimes as many as eight sessions a day, a pace that led to several marriages and divorces for Blaine. His memoir, "Hal Blaine & The Wrecking Crew," came out in 1990 and he continued to appear at symposiums and workshops into his 80s. Blaine also was seen in the 2008 documentary "The Wrecking Crew" and was played by Johnny Sneed in the Wilson biopic "Love & Mercy." "Hal was funny, sweet, and genuine," Jon "Bermuda" Schwartz, drummer for the "Weird Al" Yankovic Band, said in email to the AP. "He made you feel like you were the most important person in the room. His inspiration and influence to drummers everywhere is immeasurable. Hal was a treasure." The use of session musicians became a scandal in the late 1960s when it was discovered that the Monkees, the million-selling TV foursome, did not play on their songs. Blaine, who, of course, drummed for the Monkees, knew that many top groups depended on him and his peers. He even became friendly with some of the players he sat in for, including Wilson's brother Dennis Wilson. "He was thrilled that I was making their records because while I was making Beach Boy records, he was out surfing or riding his motorcycle," Blaine told Modern Drummer. "He was never so disappointed in his life to find out that a dozen of his favorite drummers were me."